Lawn care service calls abound these days and many clients need advice for caring for their lawn and what services we provide if you can’t go it alone! We thought this would be a great topic for our readers and hopefully you can get some great tips for improving the condition of your lawn, deciding if lawn service is right for you (and what kind) as well as answering frequently-asked questions by other Williamsburg, Yorktown and surrounding Peninsula clients. It looks like Old Man Winter is moving on and we can finally talk warmer weather and with warmer temps comes… you got it! Weeds! Many folks need to pretreat for broadleaf and crabgrass right now. We use a preventative to control the weeds throughout the growing season. Prosecutor is used for weed control in beds and hard surfaces. We also recommend a pre-emergent that prevents the weeds from ever rearing their insipid little heads. From March to May seeding, fertilization and cultivation/dethatching should also be performed. The Virginia Cooperative Extension has great videos entitled, “Lawn to Dye For” with excellent and easy tips for dethatching, fertilizing and treating for pre-emerging weeds. Rejuvenation pruning to reduce the size of overgrown broadleaf evergreens should be done in March and early part of April. Think about gardenias, hollies, ligustrum, nandina, photina, and pyracantha. Don’t forget to fertilize and water as well! Remember only prune Spring flowering plants such as forsythia and Azaleas immediately AFTER they bloom. These should not be sheared, but should be selectively pruned. See our Landscape Resources page for tips on cutting back and deadheading you perennials as well as other typical problems such as deer control and erosion issues that are specific to our Peninsula clients. There is no substitute for protecting your lawn from future problems that result from neglect- or what we describe as not investing enough into maintenance for your outdoor retreat. Often clients love the results of their new plantings and their beds are laid out to give them enjoyment for longevity, but even with the most carefully-planned plant choices for your soil-type, zone and level of care, if it is not maintained, it will result in overgrowth, disease, and contribute to larger problems such as interfering with underground lines, plumbing and can even undermine your foundation if left unchecked. We service clients with every level of need and budget. 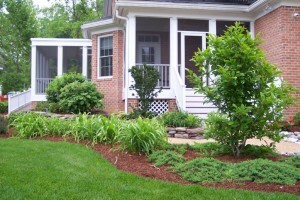 We have some that only need our Express Care which is a mow, blow and go for a low monthly price, to more extensive lawn care maintenance packages that include weeding, trimming and leaf removal, all the way to highly specified Garden Care packages that feature services exclusive to our client’s property and specific needs, such as selective pruning, mulching and bed care. Whatever your lawn care service needs- we have plan. The worst plan is not having a plan! Many of our clients love enjoying their outdoor retreat with the family and want to protect the environment and pets from any reactions caused by materials and treatments that are carcinogenic and otherwise unhealthy to people, pets and the environment. Custom Gardens is known as a company that takes its responsibility to steward the environment very seriously. We always encourage using materials that are safe for the environment and your pets that have low to no impact on existing habitats. Click here for products and advice for your lawn care and garden that will treat a range of problems from lawn thatch digesters to natural pond cleaners- these are safe and effective products. Also, check out some of our other recommended products and treatments from a 2013 blog that covers everything from deer repellant for your plants to chemical-free fertilizers. As we journey into Spring don’t forget that we would love to help prioritize your gardening needs and offer any helpful advice! We love hearing from you so please feel free to leave any comments or questions here on our website or give us a call at (757) 833-8110!